“It is not people’s ignorance you need to fear, it’s what they know which darned well true any longer that causes the problems”. “You will never leap a canyon in two short jumps”. Adults are rightly concerned about the ability of young people to develop the skills and attitudes needed for future employment and participation in responsible community life. In cities and communities of all kinds around the world, far too many young people are failing to acquire the tools they require for the future. Without such skills, attitudes and expertise such young people are unable to participate within or help in the creation of “the good life”. They quickly lose their connections with family and community and, instead of becoming a developing asset become instead an economic and social liability. In great part, it resulted from the industrial revolution of the mid-19th Century when the changes brought about by the emergence of factory-based work created the need for people with the basic skills and attitudes appropriate to a manufacturing economy – ie, people who could follow directions and perform relatively straightforward repetitive tasks in a disciplined and predictable manner. The Factory Model of Schooling, which dates specifically from this period, exactly paralleled what was seen as the most cost efficient way to organise a manufacturing process. In this model, learning is seen as heavily dependent upon the teacher to impart information and routine skills largely through “chalk and talk”, “drill and practice”, and through textbooks as the principal technology. Learning which since the beginning of time had been inseparable from the work of the community and life of the family, suddenly became separated from everyday affairs. Progressively learning and schooling began to be thought of as synonymous. As schools took increasing responsibility for both formal learning and social development, young people became ever more isolated from the adult members of their communities, including their own parents and caregivers. What now mattered was what was “taught” not what was intuitively understood; teachers and simulated experience replaced “learning on the go”, and real experience on the job and in the community. Schools, while meeting the immediate needs of the manufacturing economy, then became a major contributory factor in the creation of the dysfunctional community; no longer did the community have a direct role to play in inducting the young into adulthood (an activity which had bound together the family, the clan or the tribe since the beginning of time), and the young themselves no longer saw that they had any personal responsibility within the community. Today as nations move from a manufacturing to a knowledge-based economy, individuals increasingly need skills that go far beyond the 19th Century relevant “basics” taught in schools. In addition to the skills of numeracy, literacy, calculation and communication – I call these the Old Competencies – without which people can’t start to function in any form of modern society and particularly in the Knowledge Society, we now need a whole series of New Competencies – the ability to conceptualise problems and solutions using at least four basic skills; abstraction (the manipulation of thoughts and patterns), systems thinking (inter-related thinking), experimentation, and collaboration, as well as the mastery of the new technologies of information and communication. But such skills, practices, and attitudes cannot be taught solely in the classroom, nor can they be developed solely by teachers. There is now the need to recognise and exploit the fact that schooling in the future must involve both learning in school and learning through a variety of community experiences. Young people need the support not only of teachers but of their peer group and – critically – of adults of all kinds. The immediate reaction of public, education reformers, and politicians has, however, been to assume that these higher order skills can in fact be “taught”, and therefore that the schools should simply be developed still further. This is neither possible, nor practical. Higher order thinking and problem-solving skills grow out of direct experience, not simply teaching. They require more than classrooms; they need active involvement in the real life experiences of the community. The problem goes beyond the school gates, and starts before children go to school. Society itself is becoming painfully aware that our communities are increasingly dysfunctional. Crime, drugs, poverty, unemployment, family disintegration and urban decay have led to hopelessness, cynicism and despair. Clearly, the two issues are inter-connected. Thoughtful specialists in many disciplines are increasingly arguing that the root cause of both education and community problems is a basic misunderstanding about the nature of human learning. Central to this thinking are the new understandings about human learning which are emerging rapidly from neurological and biological studies of the nature of the brain. These, coming together with studies in other disciplines, are showing the amazing human capability to learn (which has evolved over several million years to give mankind its intellectual mastery over all other species) as a collaborative, problem-solving, sense-making activity that – fed by a rich, challenging but relatively low-threat environment – enables the individual, providing self-confidence is intact, to perform prodigious feats of learning. (America was built on the likes of Benjamin Franklin, men who trusted their own judgement, and knew how to use the environment to their own advantage). Because schools largely ignore the individual’s own learning strategies, and substitute instead a highly didactic top-down model of learning, the self-confidence of many has been largely destroyed. Instead of an “I can do it” mentality, it has become an “I am not a specialist; I can’t do that” mentality. It is this which is wreaking havoc with young people in school, and with other generations in their social and community life. 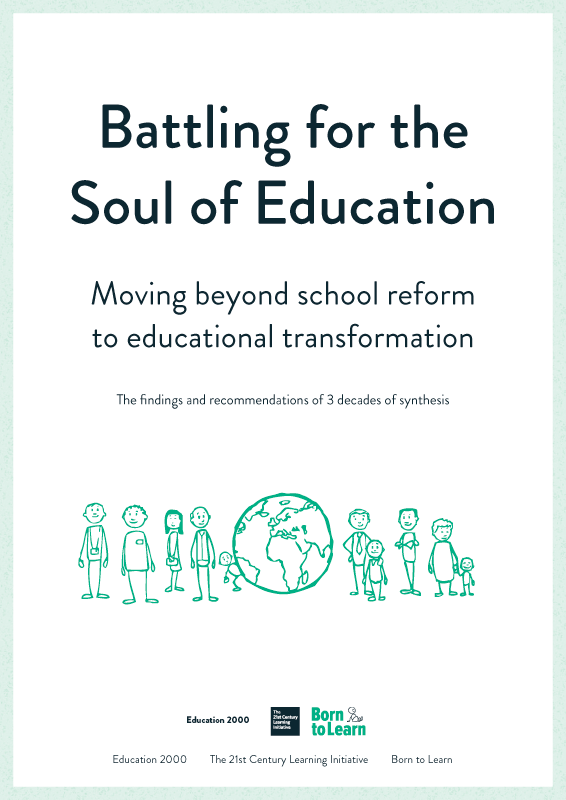 What is needed is not a new form of School, not “more of the same only better”, but a new form of schooling – a form of community life in which living, working and learning are re-united. The full implications of this are daunting. Those implications require a reappraisal of how learning takes place (it’s not the necessary consequence of teaching). They require a reconsideration of the place of young people in society. They require a new demonstration of the role and importance of the entire “community”, and the release of the potential power of the new technologies of information and communication. Not so long ago, young people learned about work by working, and about the community by direct participation within it. Young people were needed and therefore valued. As they worked, so they learned from their elder’s skills that were part theoretical, part practical, and part intuitive. In today‘s society, which confuses learning with schooling, this earlier world is hard to envisage… yet its achievements were immense. Britain led the world into the industrial revolution in the early part of the 19th Century when more than half the population had less than two years of schooling. But it was far from an ignorant society. People learned on-the-job; they learned from each other, they talked about their work, they formed guilds, and they were proud of their successes. Living, working and learning were all part of a seamless web. It was, to use the modern jargon, a Comprehensive Learning Paradigm (CLP). It is possible to imagine how much richer become the opportunities for learning when schools and communities work to a common agenda; when the student emerges as the worker, and the teacher as the facilitator, when pre-school and primary education are emphasised; when technology is used to open up learning opportunities unconstrained by time and place; when secondary schools prepare their students to take ever increasing responsibility for their own learning; and when during the final years of formal education students are formally and progressively inducted into the adult world. Until recently, the model of a successful business or social organisation was one in which decisions were taken at the top and transmitted downwards to those who were expected simply to obey orders, schools still function in this manner. Today, however, organisations have opened up; networks of smaller units, each with a high degree of autonomy, are becoming ever more important. The individuals who work in these re­shaped workplaces need the confidence and ability “to think for themselves”. The ability to learn and go on learning matters as never before; so does the ability to make moral and ethical decisions. Our growing understanding of effective learning suggests that it is essentially a social activity. It relies upon knowledge construction more than knowledge transfer. Understanding relies upon knowledge, and reflecting on experience; abstract knowledge which remains inert, soon evaporates. Thus the crisis of education is not so much the failure of teaching in the classroom but the failure of the community at large to capture the imagination, involvement, and active enthusiasm of young people. As the role of teacher changes from instructor to facilitator and mentor, so the community will simultaneously need to come forward in ways that are so old as to be brand new. More than 10 years ago, mindful of the fact that most children no longer understood what their own parents did at work, let alone what was involved in other employment, a community in northern Sweden set up what came to be called the “Work Orientation Programme“. At the age of 7, children spent a day shadowing their father at his place of work and a day shadowing the mother at hers. Then they spent 2 days shadowing their best friends’ parents. So successful was this that by the age of 10 the shadowing was increased to 5 days a year; to 10 days a year for a 13 year old, and 15 days at 16. Always this was done on a one-to-one basis, and always it was direct observation, not work experience. In all, young people had more than 20 weeks of such opportunities to observe real work before leaving high school. “Remarkably good for the young people”, I commented when I was first shown this scheme. “Ah, but think what it means for the adults”, responded my guide. “Firstly, we all clean our shoes 12 times more a year than we did previously; secondly, we have got used to being asked apparently naive questions about why we do things in a particular way, which we can’t answer logically, so we have now changed quite significantly what we do; and, thirdly, there is not an adult in this community who does not now realise that the education of young people is far too important to be left to teachers alone, in schools, separated from our daily activity. We know that we all have to help young people come to adulthood… actually we like doing this very much, most of the time. The employers are very supportive; they see it having an excellent effect on the community”. If the Old Competencies could be learned in the classroom, the New Competencies need much direct personal experience which is learnt as much from “doing”, as from study. What is needed is not a new form of school, but a new form of schooling (Peter Drucker) in which a variety of learning experiences are combined in a way that will increasingly wean children and youth of their dependence on the school and the teacher, and will progressively induct them into an adult life, of continuous learning. “Choice” and Charter Schools are at best the necessary conditions for effective teaching of Old Competencies; they are not sufficient vehicles for the New Competencies. We must think in very old and therefore quite new ways about the role of learning at home via family and technology, about how the community can facilitate learning about the values, attitudes, and skills necessary if community itself is to survive; and about how to use the adult workplace to enlarge the perspectives, ambitions and skills of all young people, perhaps particularly those most at risk but all others as well. We must think in different ways about learning. Then we can start to solve the problems of both education and the community.